We’re nearing the end of our series, “St. 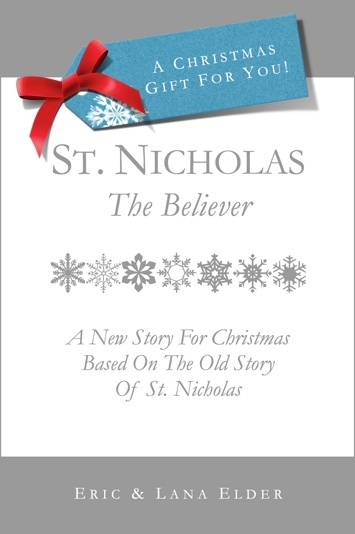 Nicholas: The Believer,” a new story for Christmas based on the old story of St. Nicholas. Here’s Part 6 of 7 and we’ll post the conclusion on Christmas Eve. If you’ve been reading a chapter a day and want to finish by Christmas Day, you’ll want to read today’s post in the next two days! (Or you can just keep reading a chapter a day, and finish over the holidays, no worries!) If you missed the beginning of the story, you can still catch up and read it at these links: Part 1, Part 2, Part 3, Part 4, and Part 5. St. Nick’s in a fix…read more in Part 6! “But how could she, when she knew I was in prison?” It was a conversation they had had before, but Nicholas still found it astounding. Dimitri insisted on keeping his act of giving a secret, just as Nicholas had done whenever possible, too. And with that, Nicholas was satisfied, as long as God got the credit in the end. For, as Nicholas had taught Dimitri years earlier, there’s nothing we have that did not come from God first. “She’s completely and utterly happy for me to go with you. She knows how important this is to you, and she knows how much it means to me as well. I wouldn’t miss it for the world,” said Dimitri. Yet there it was, a summons from the Roman emperor to appear before him at Eastertide. The only summons a bishop would have gotten under Emperor Diocletian would have been an invitation to an execution—their own! But under Constantine’s leadership, life for Christians had radically changed. Constantine had not only signed the edict that called for true tolerance to be shown to the Christians, which resulted in setting them free from prison, but he also had started giving them their property back—property which had been taken away under his predecessor. Constantine was even beginning to fund the building and repair of many of the churches that had been destroyed by Diocletian. It was the beginning of a new wave of grace for the Christians, after such intense persecution before. As a further sign of Constantine’s new support for the cause of Christianity, he had called for a gathering of over 300 of the leading bishops in the land. This gathering would serve two purposes for Constantine: it would unify the church within the previously fractured empire, and it wouldn’t hurt his hopes of bringing unity back to the whole country. As the leader of the people, Constantine asserted that it was his responsibility to provide for their spiritual well-being as well. As such, he pledged to attend and preside over this historic council himself. It would take place in the city of Nicaea, starting in the spring of that year and continuing for several months into the summer. When Nicholas received his invitation, he quietly praised God for the changing direction of his world. While the Great Persecution had deepened the faith of many of those who survived it, the same persecution had taken its toll on the ability of many others, severely limiting their ability to teach, preach and reach those around them with the life-changing message of Christ. Now, those barriers had been removed—with the support and approval of the emperor himself. The only barriers remained were within the hearts and minds of those who would hear the good news. As for Nicholas, he had grown in influence and respect in Myra, as well as the region around him. His great wealth was long since gone, for he had given most of it away when he saw the Great Persecution coming and what remained had been discovered and ransacked while he was in prison. But what he lost in wealth he made up for in influence, for his heart and actions were still bent towards giving no matter what he had or didn’t have to give. After giving so much of himself to the people around him, he was naturally among those who were chosen to attend the upcoming council. It would turn out to become one of the most momentous events in history, not to mention one of the most memorable events in his own life—but not necessarily for a reason he would want to remember. In Arius’ zeal to see that people worshipped God alone, he could not conceive that any man, even one as good as Jesus, could claim to be one with God without blaspheming the name of God Himself. In this, Arius was not unlike those who persecuted Jesus while He was still alive. Even some of those who witnessed His miracles with their own eyes, and heard Jesus’ words with their own ears, could not grasp that Jesus could possibly be telling the truth when He said, “I and the Father are one.” And for this, they brought Jesus to Herod, and then to Pilate, to have Him crucified. Nicholas had wondered about Jesus’ claim as a boy, too. But when Nicholas was in Bethlehem, it all finally made perfect sense to him—that God Himself had come down from heaven to earth as a man to take on the sins of the world once and for all as God in the flesh. Arius was like the Apostle Paul before he met the Jesus on the road to Damascus after Jesus had risen from the dead. Arius could not believe the claims of Jesus and His followers, and in Arius’ zeal, he became like the Apostle Paul before his life-changing experience, wanting to protect what he felt to be the divinity of God by persecuting anyone who said they worshipped Jesus as God. For no man, according to Arius and Paul’s earlier way of thinking, could possibly consider himself to be one with God. But on the road to Damascus, as Paul was on his way to round up and kill more Christians in his zeal, Paul met the Living Christ in a vision that blinded him physically, but awakened him spiritually to the Truth. In the days that followed, Paul’s physical eyes were healed and he repented of his misguided efforts. He was baptized in Jesus’ name and began to preach from then on that Jesus was not merely a man, but that Jesus’ claims about Himself to be one with the Father were completely true. Paul gave his life in worship and service to Christ, and had to endure, like Nicholas had to endure, imprisonment and an ever-present threat of death for his faith. Arius was more like the religious leaders of Jesus’ day who, in their zeal to defend God, actually crucified the Lord of all creation. Thus, Arius felt justified in trying to gather support among the bishops for his position. Nicholas and Dimitri didn’t think Arius’ ideas could possibly gather many supporters. Yet they would soon find out that Arius’ personal charisma and excellent oratorial skills might actually hold sway over some of the bishops who had not yet given the idea nor its implications full consideration. Nicholas and Dimitri, however, like the Apostle Paul, the Apostle John and tens of thousands of others in the time since Jesus had lived and died and risen again from the dead, had discovered that Jesus was, thankfully and supernaturally, both fully human and fully divine. After the grand processional of bishops and priests, the boys’ choirs and Constantine’s opening words, one of the first topics they addressed was this issue brought forth by Arius—whether or not Jesus Christ was divine. Arius made his opening arguments, with great eloquence and great persuasion, in the presence of Constantine and the rest of the assembly. Jesus was, he asserted, perhaps the foremost of all created beings. But to be co-equal with God, one in substance and essence with Him, was impossible. No one could be one with God. Nicholas listened in silence, along with every other bishop in the room. Respect for the speaker, especially in the presence of the emperor, took precedence over any type of muttering or disturbance that might accompany any other gathering on a subject of such intensity. But the longer Arius spoke, the harder it seemed for Nicholas to sit in silence. Nicholas’ parents had given their lives for the honor of serving Christ. Nicholas had been overwhelmed by the presence of God in Bethlehem, at the very spot where God made His first appearance as Man in the flesh. Dimitri, Samuel and Ruthie had all been similarly affected by that visit to Bethlehem. They had walked up the hill in Jerusalem where the King of kings had been put to death by religious leaders, leaders who, like Arius, doubted Jesus’ claims to be one with God. Nicholas had always realized that Jesus was unlike any other man who had ever lived. And after He died, He had risen from the dead, appearing to the 12 disciples, as well as more than 500 others who were living in Jerusalem at the time. What kind of man could do that? Was it just a mass hallucination? Wishful thinking on the part of religious fanatics? But they weren’t just fans, they were followers who were willing to give up their lives for their Lord and Savior. Nicholas’ mind flooded with Scriptures like these, as well as with memories of the years he had spent in prison, years he would never get back again—all because he was unwilling to worship Diocletian as a god, but was fully willing to worship Jesus as God. How could Nicholas remain silent and let Arius go on like this? How could anyone else in the room take it, he thought? Nicholas had no idea. Without warning, and without another moment to think about what he was doing, Nicholas stood to his feet. Then his feet, as if they had a mind of their own, began to walk deliberately and intently across the massive hall towards Arius. When Nicholas stood directly in front of Arius, Arius finally stopped talking. This breach of protocol was unprecedented. Then, turning back towards Arius and facing him directly, Nicholas did the unthinkable. In plain site of the emperor and everyone else in attendance, Nicholas struck Arius hard in the face with his fist. Arius stumbled and fell back, both from the from the impact of the blow and the shock that came with it. Nicholas, too, was stunned—as well as everyone else in attendance. With the same deliberate and intentional steps with which he had walked across the room, Nicholas now walked back to his chair and took his seat. The vast majority in the room looked like they could have jumped to their feet and given Nicholas a standing ovation for his bold act—including, by the look on his face, possibly the emperor himself! But to others in the room, Arius chief among them, no words or displays of emotion were needed. Everyone knew what an outrageous offense Nicholas had just committed. It was, in fact, illegal for anyone to use violence of any kind in the presence of the emperor. The collective gasp of the crowd when Nicholas struck Arius, and the subsequent commotion that erupted when Nicholas had sat back down in his seat, now threatened to throw the entire proceedings into chaos. Constantine knew the law, of course, but also knew Nicholas. He had even once had a dream of this particular bishop, one which resulted in his granting a stay of execution to three men in his court. Constantine had bought both time and goodwill among the various factions. The council on the whole seemed to agree with Nicholas’ position, at least in spirit, even if they could not agree with his actions. They wanted to exact some form of punishment, as to not do so would fail to honor the rule of the law. But having been given permission by the emperor himself to do as they saw fit, rather than the emperor’s own law—which in this case meant to immediately cut off the hand of anyone who struck another person in the presence of the emperor—they felt the freedom to take another form of action. After a short deliberation, the leaders of the council agreed and determined that Nicholas should be defrocked immediately from his position as a bishop, banished from taking part in the rest of the proceedings in Nicaea and held under house arrest within the palace complex to await any further decision the council might see fit at the conclusion of their meetings that summer. It was a lenient sentence, in light of the offense. But as for Nicholas, even before he heard what his punishment was going to be, he was already punishing himself more than anyone else ever could for what he had just done. Within less than a minute, he had gone from experiencing one of the highest mountaintops of his life to experiencing one of its deepest valleys. Here he was attending one of the greatest conclaves in the history of the world, and yet he had just done something he could never take back. He knew immediately that the ramifications would affect him the rest of his life, for whatever remained of it. It was a sensation that could be understood, perhaps, only by those who themselves had ever experienced it before—the weight, the shame and the agony of a moment of sin that was, apart from the forgiveness of Christ Himself, crushing. Nicholas was disrobed of his bishop’s garments in the presence of the assembly and escorted from the room in shackles. But these kinds of disgraces were mere trifles compared to the humiliation he was experiencing on the inside. He was even too numb to cry. “What have you done?!? What else could you have done?” countered Dimitri. “If you hadn’t done it, someone else would have, or at least should have. You did Arius, and all the rest of us, a favor with that punch. Had he continued with his diatribe, who knows what punishment the Lord Himself might have brought down upon the entire gathering!” Of course, Dimitri knew God could take it, and often does, when people rail against Him and His ways. He is much more long-suffering than any of us could ever be. But still, Dimitri felt Nicholas’ actions were truly justified. In the other cell, he knew he was there because of the misguided actions of others, giving him a sense that what he had to endure there was part of the natural suffering that Jesus said would come to all who followed Him. But in this cell, he knew he was there because of his own inane actions, actions which he viewed as inexcusable, a viewpoint which he felt many of those in attendance would rightly share. Dimitri’s words lingered in the air. As Nicholas contemplated them, a faint smile seemed to appear on his face. Perhaps, there was something to be said for his heart in the matter after all. He was sincerely wanting to honor and defend his Lord, not to detract from Him in any way. Peter, he remembered, had a similar passion for defending His Lord. And Nicholas now realized what Peter may have felt when Peter cut off the ear of one of the men who had come to capture Jesus. Jesus told Peter to put away his sword and then healed the man’s ear. Jesus could obviously defend Himself quite well on His own, but Nicholas had to give Peter credit for his passionate defense of his Master. Nicholas was hardly convinced that he had done the right thing, but he felt in good company with others who had acted on their passions. And Dimitri’s words helped him to realize that he was not alone in his thinking, and he took some comfort from the fact that Dimitri hadn’t completely forsaken him over the incident. This support from Dimitri acted like a soothing tonic on Nicholas’ soul, and helped him get through yet another of the darkest times of his life. Although Nicholas was convinced that the damage he had done was irreversible in human terms—and that God was going to have to work time-and-a-half to make anything good come out of this one—Nicholas knew what he had to do. Even in this moment of his deepest humiliation, he knew the best thing he could do was to do what he had always done: to put his complete faith and trust in God. But how? How could God possibly use this for good? Dimitri began, “What kind of story would you like to hear? A good story or a bad story?” It was the way Nicholas had introduced the Bible stories he told to Dimitri, Samuel and Ruthie during their many adventures in the Holy Land. Nicholas would then launch into a story, delighting the children with a story from the Bible about a good character or a bad character, or a story that seemed either good or bad at the beginning, but ended the exact opposite. Nicholas had told them that he had watched people’s reactions whenever his father told stories back home. Now, it was Dimitri who was telling the story to Nicholas. The story he told was about another man who had been sent to jail, too, by the name of Joseph. Dimitri recounted for Nicholas how Joseph’s life appeared to go up and down. Nicholas knew where this was going. All of Nicholas’ fears and doubts faded in those moments and he knew what he had to do—what he wanted to do. He had to trust the Storyteller, the One who was writing the story of his life, too. His story wasn’t over yet, and he had to trust that the God who brought him this far could see him through to the end. Nicholas looked at Dimitri with a smile of thanks and closed his eyes. It would be a long two months of waiting for the council’s decision. But he knew he could trust God in that moment, and then next, and then the next. If he could just keep trusting God from moment to moment, those moments would turn into minutes, and minutes into hours. Then the hours would turn into days and weeks and months. He knew it all began with a moment. With his eyes still closed, He put his full faith and trust in God again. The peace of God flooded his heart, and soon two months had passed by. The council was ready to make their final decisions on many matters, including the decision that had landed Nicholas under house arrest in the first place, and Nicholas was about to find out the results. The relief that swept over Nicholas was palpable. Dimitri could feel it in his own body, too, as he watched the news flood over Nicholas’ entire being. Both pieces of news were the best possible outcome Nicholas could have imagined. Even though Nicholas’ action had cost him his position as a bishop, it had not jeopardized the outcome of the proceedings. It was even possible—though he never knew for sure—that his action against Arius had in some way shaped what took place during those summer months at that historic council. Within minutes of Dimitri’s arrival in his room, another visitor appeared at Nicholas’ door. It was Constantine himself. The council’s decision about what to do with Nicholas was one thing, but Constantine’s decision was another. A fresh wave of fear washed over Nicholas as he thought again of the possibilities. Nicholas had been listening to Constantine’s words as if it were a dream. He could hardly believe his ears. But when the emperor said the word “home,” Nicholas knew this wasn’t a dream, and the word rang like the sweetest bell in Nicholas’ ears. Of all the words the emperor had just spoken, none sounded better to him than that final word: home. He wanted nothing more than to get back to the flock he served. It was for them that he had come to this important gathering in the first place, to ensure that the Truths he had taught them would continue to be taught throughout the land. After two months of being separated from them, and the ongoing question of what would become of them and and the hundreds of thousands like them in the future who would be affected by their decisions here, Nicholas could finally go home. His heart was light and he was free, in more ways than one. Did you know you can listen to 2 full-length Christmas albums on The Ranch website for free, anytime day or night? 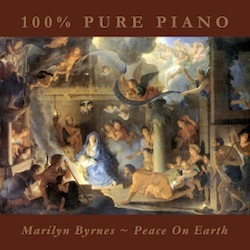 Click the album cover below to start listening to “Peace On Earth” now! (The other one is called “Christmas“) Enjoy!